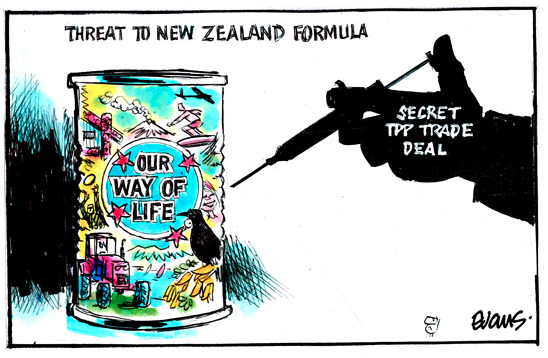 "A range of labour, health and environmental organisations are calling for a clause to be inserted into the CPTPP Amendment Bill that would prevent future governments from extending investor-state dispute settlement (ISDS) to countries seeking to join the agreement," says Oliver Hailes, spokesperson for It’s Our Future, the network of opposition to the TPPA and other economic treaties that undermine democracy. "We have suggested wording to achieve that result, and we encourage all New Zealanders to submit before Friday in support of an amendment to stop the spread of ISDS." The Foreign Affairs, Defence and Trade Committee is in the process of examining draft legislation that would change New Zealand law to comply with impending obligations and pave the way for the Government to ratify the CPTPP. It’s Our Future has recommended a new clause for the bill that would prevent a future government from consenting to any additional country joining the controversial agreement without first signing a binding instrument with that country in which it agrees to exclude ISDS against New Zealand. Mr Hailes applauded the Labour Government’s policy not to include ISDS in future trade agreements, but he noted that ISDS could nonetheless expand under the CPTPP because several countries have reportedly expressed interest in joining: the United States, United Kingdom, South Korea, Thailand, Taiwan, Philippines, Indonesia and Colombia. "Our Parliament must prevent New Zealand from backsliding deeper into the discredited ISDS system by transforming the policy of the present Government into a binding commitment under domestic law." The submission calling for an amendment to stop the spread of ISDS has been endorsed formally by these organisations: ActionStation, Association of Salaried Medical Specialists (ASMA), Campaign Against Foreign Control of Aotearoa (CAFCA), Council of Trade Unions (CTU), Doctors for Healthy Trade, First Union, It’s Our Future - Kiwis Concerned About TPPA, OraTaiao - New Zealand Climate and Health Council, Public Service Association (PSA), Public Health Association (PHA), and Tertiary Education Union (TEU).